Days of Our Lives (DOOL) spoilers tease that Eric (Greg Vaughan) and Nicole’s (Arianne Zucker) scheme will be derailed. Since Xander’s (Paul Telfer) a nasty threat and the last hurdle to “Ericole” bliss, they’ve decided to kill him. Nicole feels like it’s the only way out of the jam she’s stuck in. She won’t feel too bad about ridding the world of one more villain. However, Xander can be awfully slippery. That’s especially true since he’s got Kristen (Stacy Haiduk) on his side. Days of Our Lives spoilers say their partnership will come with some complications, but they’ll try to stick together. Kristen and Xander could prove to be a very powerful team, so that’ll provide more obstacles for Nicole and Eric. Thanks to Stefan’s (Tyler Christopher) new lead, Sami (Alison Sweeney) will find herself in her brother’s orbit. She’ll meet up with Eric and realize they’re sort of on the same track. Next week, Days of Our Lives spoilers say Nicole, Eric and Sami will join forces for one big plot. Sami will obviously be looking for EJ (last played by James Scott), but finding Xander may bring her a step closer. Likewise, Nicole and Eric will need to find Xander for his murder. Unfortunately, Xander may find out that his life’s in jeopardy. He knows how to take drastic action, so that’s exactly what he’ll do. DOOL spoilers state that Nicole will end up in Xander’s grasp again. She’ll fear a deadly outcome, but Eric won’t give up home. It appears Nicole will end up in a secret warehouse with Xander. She’ll make a jaw-dropping discovery, which may be EJ – or someone she believes could be him. 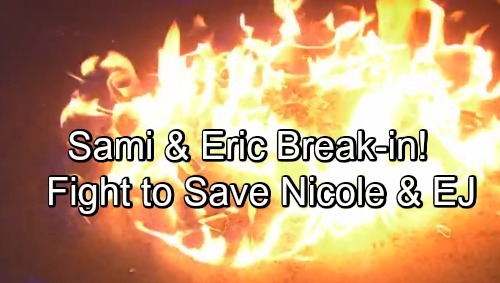 Eric and Sami will determine that their loves are trapped inside this warehouse, which is set to explode. That’ll lead to a race against time and some heroic efforts. Days spoilers reveal that Sami will help Eric break in. They’ll hope they can save their soul mates before it’s too late. Can these siblings pull off their desperate plan? Will everyone make it out of this mess alive? Days of Our Lives spoilers hint that major mayhem’s brewing, so we’ll give you updates as other news comes in. Stay tuned to DOOL and don’t forget to check CDL often for the latest Days of Our Lives spoilers, updates and news.